Classical Encounters is a meeting place for (chamber) music lovers and a breeding ground for creative adventure. The festival is not only a podium for music, but also a laboratory, within which musicians research the artistic scope of their musical performance. Our 15th jubilee in 2018 was the perfect moment for presenting our ‘repackaging’ to the public. From 2018, the festival continued under a fresh new name: Classical Encounters. Chamber music thrives in an intimate setting. The festival incorporates chamber music venues such as the New Church (Nieuwe Kerk) in the Hague and the Duivenvoorde Castle but has also previously been on less obvious locations, such as the Power Plant, the Union, museums, and the beautiful hidden Spanish Court townhouse (Spaansche Hof). Classical Encounters also chooses locations that are normally not accessible by the public, such as living rooms and embassies. We try to give a little bit extra with each concer, everyone will have more adventure than what they are used to. Although we cherish an attentive public, the ambiance is informal on purpose. The musicians have personal contact with the visitors, play at the homes of music lovers (Hague Living Rooms), the public sometimes sits around the musicians, and youngsters play together under the guidance of professionals in the Viotta Youth Orchestra. Music is better done justice when (professional) musicians exceed themselves. If musicians play on routine – no matter how professionally – sparks do not fly easily. That is why Eva Stegeman gladly takes festival musicians outside of their comfort zone. She has a large international network of top musicians and carefully selects the talents and personalities that are a good match for each other; in this way, the total is more than the sum of its parts. They intensively rehearse together for several days for a concert. Such a ‘pressure cooker’ delivers a unique result that is clearly different from the work of ensembles that play together year in, year out. Furthermore, the festival is known for bringing musicians to the Netherlands who were on the threshold of an international breakthrough. The International Chamber Music Festival The Hague (Classcial Encounters from 2018) is proud to announce that we have been awarded the EFFE-label (Europe for festivals, festivals for Europe) by the European Festival Association. The EFFE-label gets awarded to festivals of the highest artistic quality that have a significant impact on the local, national and international field. 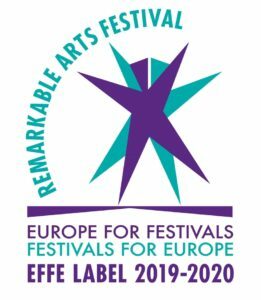 715 festivals from 39 countries received the EFFE Label 2017-2018 as ‘remarkable festivals’ in Europe. On 4 May, the Label 2017-2018 results were announced by the International Jury chaired by Sir Jonathan Mills. EFFE – Europe for Festivals, Festivals for Europe, is Europe’s Label for remarkable festivals initiated by the European Festivals Association. It is an international festival community connecting festivals that are deeply committed to the arts, their communities and Europe.